For over 350 years Nakaniida has been one of the most unusual sword making processes that has continued through generations of blacksmiths. Now this process could finally end when it�s last practitioner, Michio Ishikawa, retires. He has no apprentice as of the time of this writing, so with him goes the secrets and skills needed to make blades using the Nakaniida Proprietary process of forging. We recently discovered this blacksmith through a good friend in Japan. After hearing the story and seeing his interview on Japanese TV we decided to introduce his unique knives to our customers. Not only is the 28 stage process one of a kind, but his use of a single bevel design in knives normally made with two edges places them in the very rare category. We hardly ever see a single sided honesuki so we just had to give this a place in our store. There are some fundamental differences in cutting and sharpening styles that will be required in the use of single bevel knives. But not so hard that some practice will not overcome these obstacles. 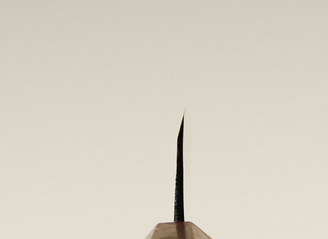 The upside of single bevel knives is their in-built acute cutting edge. Being single sided means that the inclusive edge angle is about 15 degrees as opposed to a double edge where the angle is around 30 degrees. This enhances the cutting abilities, makes food release easier and minimizes wedging. However, it does result in a blade that is restricted to right handed users. 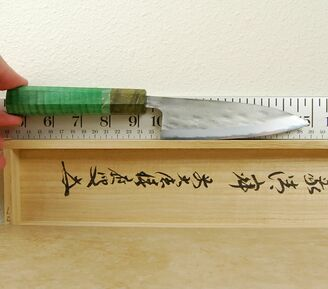 Ishikawa-san uses both White and Blue #2 steels in his knives. This knife is made with White #2 which receives a soft iron cladding. The rustic nature of his knives is very obvious and they are not the fit and finish kings that other blacksmiths produce. He places value on shape and sharpness more than on aesthetics. But at the price and considering the one-man handmade nature of these blades that is a plus, not a negative. 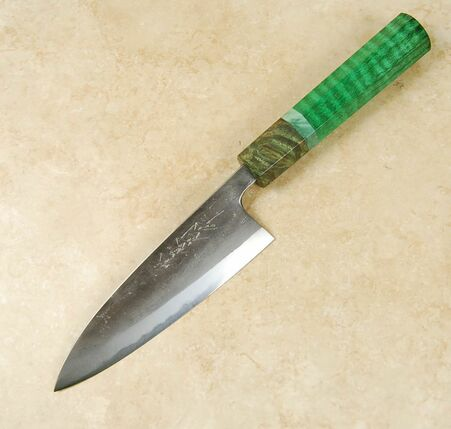 To find such unusual knives made by a craftsman of his caliber and experience is a rare thing. 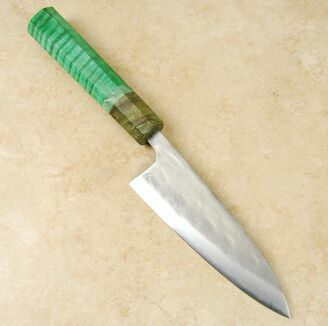 We have added a very nice octagonal custom handle made from dyed maple to further enhance the originality of the blade.